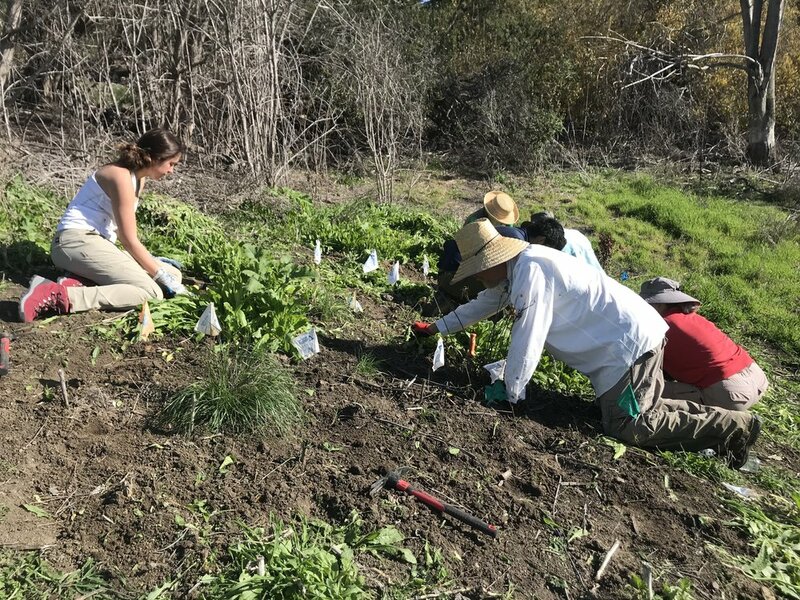 The main objective of Sunday’s event was to remove invasive weeds that were encroaching upon the milkweed and purple needlegrass, two important native plant species of the San Marcos Foothills. The volunteers worked along an important freshwater seep and focused on removing clovers, mustards, and other invasive grasses. A volunteer would set up next to a native plant, marked by a little flag poking out from the ground, and remove any invasive weeds in a one foot “halo” around the native plant. Leading the event was Kevin Thompson, a project manager for Channel Islands Restoration. He explained where and how to remove the weeds, as well as offered assistance on identifying plants and answered any other questions. Thompson has been with CIR since 2005, and has worked on all eight Channel Islands and throughout the mainland. 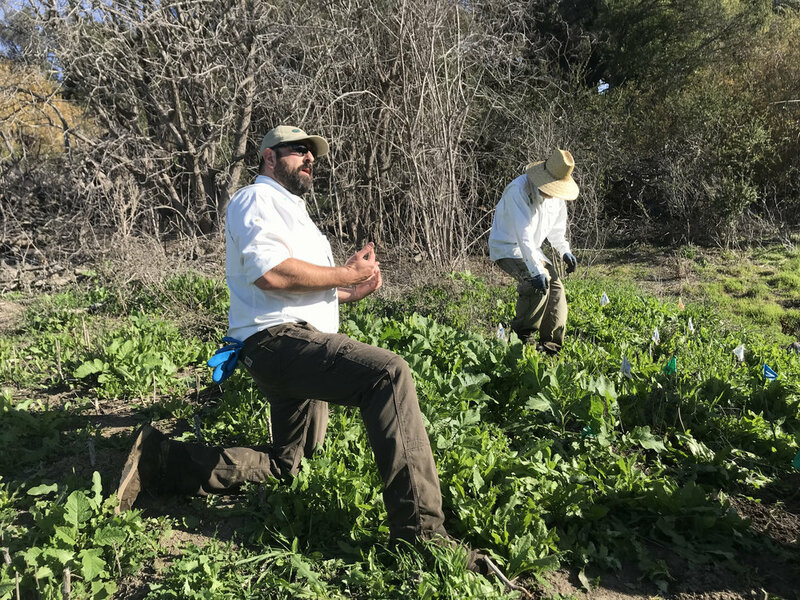 A volunteer named Jamie Uyehara explained that invasive weeds smother the native species, making it hard for them to grow because they can’t outcompete the weeds. Jamie does four to six volunteer projects a year. She said that aside from restoring a habitat, it’s a nice way for her and her husband to do something as a couple. Another volunteer named Blake Munden, who is studying biological conservation, said that coming out to San Marcos Foothills to volunteer is a great way to spend a Sunday. The volunteers worked hard to remove the offending invasive weeds all for the benefit of restoring biodiversity (the overall diversity of plant and animal life in an area). Restoring and maintaining biodiversity is vital for the health of the plants and animals in our region. For example, Kevin noted that the greater the abundance of milkweed, the greater the population of monarch butterflies, because milkweed is a great food source for them. Blake remarked that she had seen fewer monarch butterflies around Santa Barbara County this year than last year. A leading cause of the decline in monarchs has been the loss of milkweed plants along their migratory roots - the leading cause of milkweed decline has been the rapid growth of invasive weeds. “California has lost 97 or 98 percent of native grasslands. Luckily, the San Marcos preserve still has bunches of the bunchgrass,” Kevin said. Bunchgrasses – grasses that grow in clumps rather than spread out like lawn grass – are a defining part of native California grasslands. 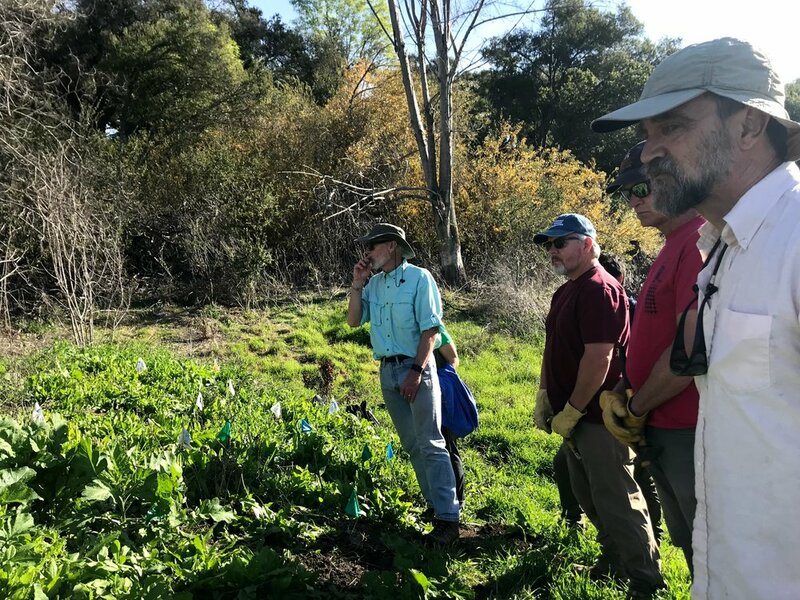 Much of the Central Coast is besieged by invasive plants, but by doing restoration events in strategic locations, we can ensure that habitat is available to the species that need it most. However, according to Thompson, CIR is only able to come to the San Marcos Foothills a couple times per year. He said that the rate the organization comes really depends on funding. REI and Patagonia are two of their biggest sponsors, but plenty of support comes from private donations from the community as well. After almost two hours of weeding, the group took a snack break in the shade, sharing past volunteer experiences. They then walked over to nearby habitat that had been restored a couple years ago. Before CIR volunteers’ work, the area was completely covered with black mustard and other weeds, but it is now flourishing with native plants and singing birds. 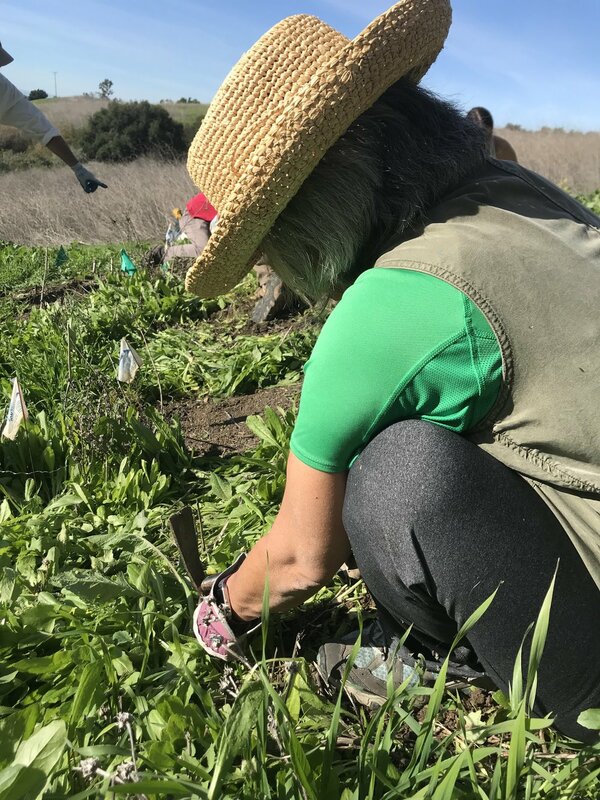 Channel Islands Restoration has two more volunteer dates in February scheduled as of now: Saturday the 16th and Sunday the 24th.